At 08 AM, our representative will meet and greet you at your hotel / address in Delhi and would introduce your tour to you. 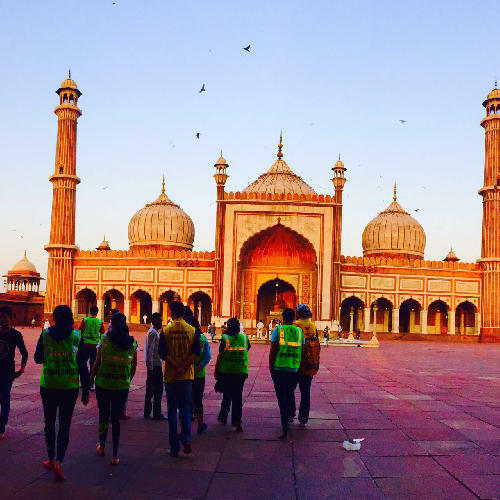 Evening, participate in a food and walking tour of the back streets of Old Delhi. While on the walking tour, we would wander through the winding narrow lanes bustling with activity. The walk would enable to us an opportunity to interact with local residents, skilled craftsmen and traditional traders. The idea is not only to bring to the visitor the history and tradition of the place, but, to also bring to you face to face with the people who have made it possible for this heritage to generate and sustain for centuries. Trinetra Tours (P) Ltd. invites you to witness and participate in the spectacle called India. We are laying out on the platter incredible and fascinating destinations; please make your pick or tell us sites you have in mind; also tell us if you have any special interest and we would use our skills to tailor make a "Special Interest" tour that would take into consideration both your choice of destination as well as your special interest be it photography, walking, biking, wildlife viewing, observing traditional cultures and lifestyles, art & architecture etc. In case you are a business traveler or need hotels at the best rate, please stop to check out our rates as we have the best deals in the business for all range of hotels from the budget to the most exquisite.